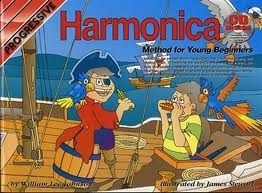 Progressive Harmonica Method is a colourful, landscape packaged book that comes with its own play along CD. 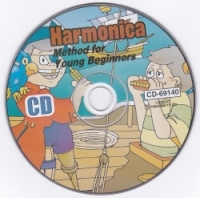 It’s ideal for young beginners, introducing them to the basics of harmonica playing and music reading. Please note you will need to buy a 10 hole harmonica in the key of C major to follow the standard notation, harmonica tab and the music CD. The book assumes a child has no prior knowledge of the harmonica or music and sets out a learning path that is logical, easy to understand and good fun. One of our parents recently bought the book for their child was full of praises. 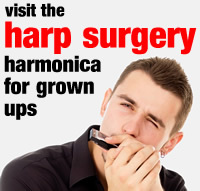 With just a few hours’ practise, his son could play chugs, single notes and a collection of simple tunes – all on a standard 10 hole harmonica. There are 11 lessons in all, with lessons 1 and 2 covering how to hold the harmonica, breathing, embouchure and the musical alphabet. Lesson 3 brings our first tone of C and introduces tab, standard notation, note values and rest values. Lesson 4 introduces D and E, chord symbols, further standard notation and some simple melodies. Lesson 5 covers G, some more simple melodies and the book’s first full song, Merrily We Roll Along. Lesson 6 moves down to F, with a train theme, trills and dotted notes. In lesson 7 we extend up to hole 6, which opens up a wealth of new repertoire, before progressing to jump notes, chords, staccato and common time in lesson 8. Lesson 9 is all about 3:4 waltz time, before learning hand tremolo, in lesson 10. Finally, lesson 11 tackles lead-in notes and some longer tunes; The Banks Of The Ohio and When The Saints Go Marching In. 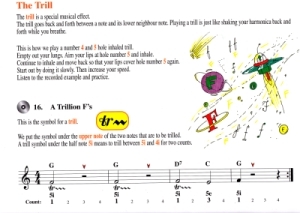 It’s a shame the C major scale isn’t completed through to hole 7 and also that harmonica tab has been re-invented with i indicating inhale and e indicating exhale. It’s no doubt easier to print than arrows, but it can be a little confusing. Blow and Draw are easier to explain to young beginners in our experience and arrows are a simpler way of representing the breathing direction for beginners. Nevertheless, the book has been tried and tested and it’s a very good investment. The Progressive Harmonica Method manual is set out very nicely with some amusing imagery and lots of energy. You can find your own copy online at Amazon.